I adore Alice in Wonderland. I have an enormous collection of Alice themed items, lots of books, including a couple over 100 years old, several old dolls, original art and prints, and various trinkets and rare items. People who love me send me interesting Alice items from all over the world. I thought for certain we would have a little girl, and her nursery would be Wonderland themed. Alas, we did not. So instead, our large dining room is my Alice showplace, the one girly spot in a house overrun with boy stuff. Not that Alice is strictly for girls- both the boys love the Disney version animated film and I've read them the book a handful of times. 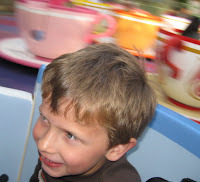 But, being the wild boys that they are, what they really love the most about Alice is the Mad Tea Party attraction at Disneyland. They really love it when Daddy makes it spin so fast that we are in danger of little Ben flying out! Wanna join us? Take your anti-nausea meds and then watch the video below!